Yes, this is the very beginning of this recap of Sunday in the NFL, but can we pause now, anyway? To pour one out for the guys who stood their ground and held out to get paid what they were worth, and the ones who are still holding out? Because Jimmy Garoppolo just gave them all even more ammunition. Never give away your leverage. Never cave to internal and external pressure. Take care of you, because the game will show no mercy. Garoppolo knows, and so do the 49ers. 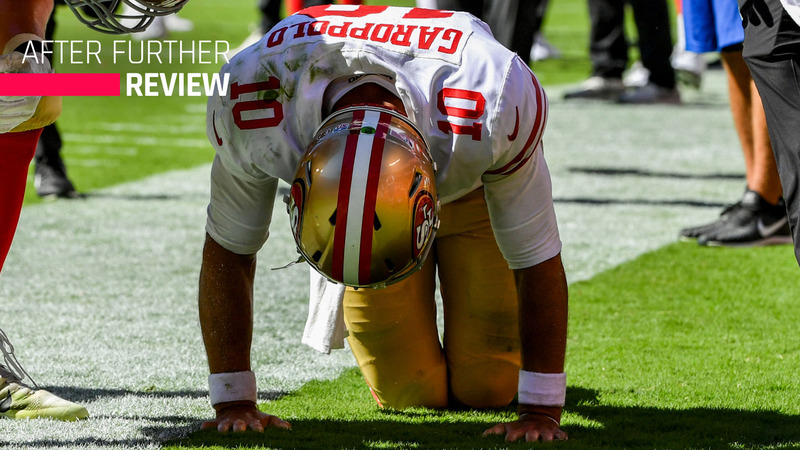 Assuming Monday’s MRI confirms the reports of a torn left ACL late in the 49ers’ loss in Kansas City, their franchise quarterback’s season is over … and so is that of his team. The 49ers’ pain is obvious, but it also proves exactly why Garoppolo was always going to cash in last offseason, and why they knew it was worth it to pay him what he wanted — $74 million guaranteed. They simply can’t replace him. Whatever success they have the rest of this season will really be a function of luck, no disrespect intended to coach Kyle Shanahan or general manager John Lynch. C.J. Beathard at least got a slight baptism as a rookie last season, after Shanahan benched Brian Hoyer and before the team traded a second-round pick to New England for Garoppolo. But this team was built for Garoppolo to run, and to run a long way, even run out of a slightly shaky start to his first full season as the starter. There’s no quarterback out there who can ride to the rescue. (For convenience, we won’t even start a discussion about a certain blackballed quarterback who once took this same franchise to the Super Bowl, but who was allowed to walk by the new regime.) As much as the NFL prides itself on its “next man up” philosophy, it almost never applies with superstars, and it applies even less with franchise quarterbacks. Stories like, say, Dak Prescott stand out specifically because they’re so rare. No matter how much teams try to sell the public on every player being replaceable and nobody being indispensable (always during contract clashes, of course), everybody with sense knows better. The Aaron Rodgerses, Aaron Donalds, Khalil Macks, Julio Joneses, Earl Thomases and, yes, Le’Veon Bells aren’t just plug-and-play pieces. Neither is Jimmy Garoppolo. The 49ers get that. It’s what they signed up for. His worth couldn’t be minimized. Neither can his loss. Which is how Zimmer dismissed a question about how he cut Daniel Carlson, his rookie kicker, following the tie with the Packers last week. Also, it’s safe to say anyone will get sent packing as coldly in the wake of the Vikings’ second straight non-win, a 27-6 dragging by the Bills. Not Kirk Cousins, who turned the ball over three times; not Anthony Barr, who was hurdled by Josh Allen, and no one else on a defense that let Allen throw for a touchdown, run for two others and take Buffalo to a 27-0 halftime lead. The Vikings also have to live with this. From the Bills, who just days ago were the targets of the humiliating annual “Can Alabama beat the (most currently godforsaken NFL team)?” question, and who got clowned online by these same Vikings for their geography-deficient travel graphic. It was a humbling Sunday for a Vikings team that, all things considered, should be 3-0 considering the schedule and the breaks (Aaron Rodgers playing on one leg). The Vikings needed that kind of cushion with their next two games on the road — Rams this Thursday night, then Eagles. One of the last two NFC teams standing last season, with a big commitment to a quarterback upgrade, should be taking advantage of the stumbling of the rest of the NFC North. Instead, they’re in the middle of it. This season won’t go down in NFL history as the Golden Age of Flawless Transitions to Rookie Quarterbacks. The Jets and Sam Darnold? Seemed like they had figured it out in their opener against the Lions … until they played Games 2 and 3. It was after last Thursday’s humiliating loss to the Browns that it began to dawn on some people that, instead of trading Teddy Bridgewater late in the preseason, keeping him and starting him to ease in Darnold might have been more prudent. The Browns? Hue Jackson is still getting scorched not just for not starting Baker Mayfield on opening day, but for not announcing him as the starter for Week 4 minutes after Thursday’s win (even though the man he’d replace, Tyrod Taylor, had suffered a concussion earlier and likely was in no condition to be told a final decision yet). The Bills? Josh Allen wasn’t ready on opening day … then he was suddenly ready a week later when Sean McDermott became the last person on Earth to recognize that Nathan Peterman was not the answer. And now, Arizona, where Josh Rosen made his NFL debut for the Cardinals with 4:31 left in a game his team was trailing by two points to the Bears. Rosen’s two possessions ended in an interception and a sack, and the Cardinals remained winless. “I felt like we needed a spark,” coach Steve Wilks explained afterward, adding, “I had total confidence in him in the moment.” Wilks has decided whether Rosen or Sam Bradford will start next week against the Seahawks. So far, so good for the Ravens and Lamar Jackson, though. Avoiding desperation through the first three games might be the best strategy of all. Maybe the Texans have too many players trying to get their legs back under them. But it feels way too much like the head coach is included. Picking the Texans to win a tough AFC South, even with the Jaguars there, was not unreasonable. An 0-3 start was, though, especially after losing to a Giants team with a sieve for an offensive line. Afterward, Bill O’Brien blamed himself and his “terrible play-calling.” His players defended him. The offense definitely looked out of sync all day, even when they started making respectable plays in the second half. But the Texans’ underachieving took place on both sides of the ball, as the defense could not keep the Giants off the field, committed foolish penalties and let Eli Manning get comfortable in ways he hadn’t come close to being all season. Waiting on O’Brien to impose his credentials on a pretty talented group of players is getting tiresome. He got a contract extension this offseason to silence the talk about his job security after last season’s nightmare. Logically, it does silence it. In reality, it’s getting loud, anyway. Mariota got it done. The Titans won, 9-6. He was showered with praise by his teammates and coaches. He directed the credit to others. … And it all seemed terribly unseemly and unnecessary. It’s understood that there’s a league-wide crisis at backup quarterback, as mentioned earlier. Blaine Gabbert started this game, after all. But this is the Titans’ franchise guy. He was dressed to play in his condition against one of the most ferocious defenses in the game, and not surprisingly, he ended up playing the majority of the game. The Titans pulled it off. Mariota did not seem the worse for wear, not immediately. It still wasn’t worth the risk. Be smarter next time, Titans.